A killer metal act that would benefit from a more succinct attack. Based in Vancouver by way of West Auckland, West of Hell hammers down influences from Iron Maiden to Judas Priest on their Spiral Empire. The band’s debut is a rock-solid compendium of 80s metal clichés mixed with just a touch of West Coast flavour. It is a devilishly fun piece of work, as a result, cementing these cats as a band to watch for years to come. West of Hell originated as an instrumental band in New Zealand. Bassist Jordan Kemp, drummer Andrew Hulme and guitarists Sean Parkinson and Ivan Vrdoljak drew critical acclaim and local notice after relocating to Vancouver in 2009. They commenced a search for a singer, hoping to add another dynamic to the business, and Chris “The Heathen” Valagao was found. Valagao is the perfect frontman for this band. He seems to have stepped right out of a smoking time machine, clad presumably in a sleeveless denim vest and leather pants. “The Heathen” has all the mandatory high notes and screams that come with the King Diamond-influenced terrain, but he’s also capable of knocking down some death metal tropes in the process and can growl like a hound of hell. The mix is ideal for West of Hell’s vivid, destructive sound. If there’s something to criticize about West of Hell’s first record, it’s that the band’s exuberance for metal can run a bit too long. Tracks that would’ve had more punch in shorter doses are ballooned into six-minute jogs and, as a result, things get kind of repetitive. The extended jamming and repeated riffing would sure as hell rock in a live setting, but on Spiral Empire it can drag things to a crawl. The album’s first track, “Father of Lies,” is an example. West of Hell sets up brilliantly, caving in faces with a well-timed, cymbal-heavy intro that leads into the blistering arrival of Valagao’s vocals after a couple of twisting riffs. The track careens through its metal paces, but runs out of gas just after four minutes in. The band carries off into another segment, though, and the song’s impact is dulled. The same problem blunts “Singularity,” a six-and-a-half minute cut that feels too spread out for its own good. Happily, most of Spiral Empire swells with energy and force. “To War” features a tremendous intro and sounds like an ideal concert opener, while “Water of Sorcery” packs enough audience-pleasing moments for a throng of ten thousand. The twin guitar work on the latter is face-destroying. 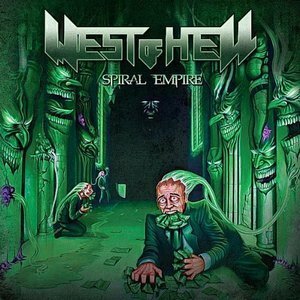 Overall, Spiral Empire is a damn fun throwback to a better time in metal and West of Hell is a damn fun band. Their energy is infectious, their riffs are daring and “The Heathen” is every bit the old school warlock he needs to be to lead this fiery unit into the abyss and back again.